The Rambo® Deluxe Fleece combines a classic look with excellent thermal and moisture-wicking properties to give you a fleece that is anything but basic. 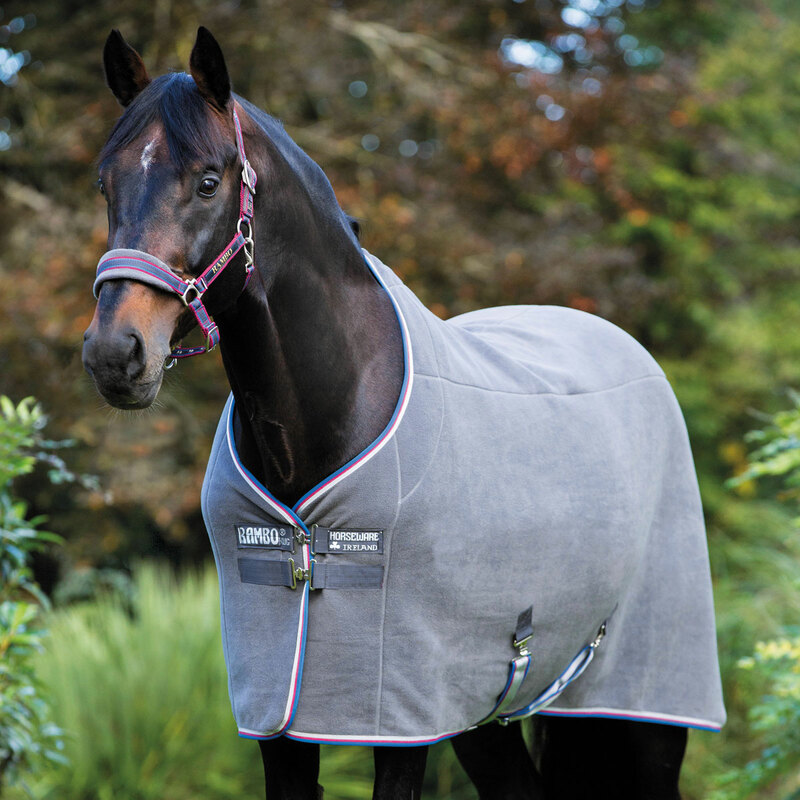 Made from high-quality fleece that’s anti-pilling and double bonded for durability, it effectively wicks away moisture while allowing your horse to cool gradually and comfortably. 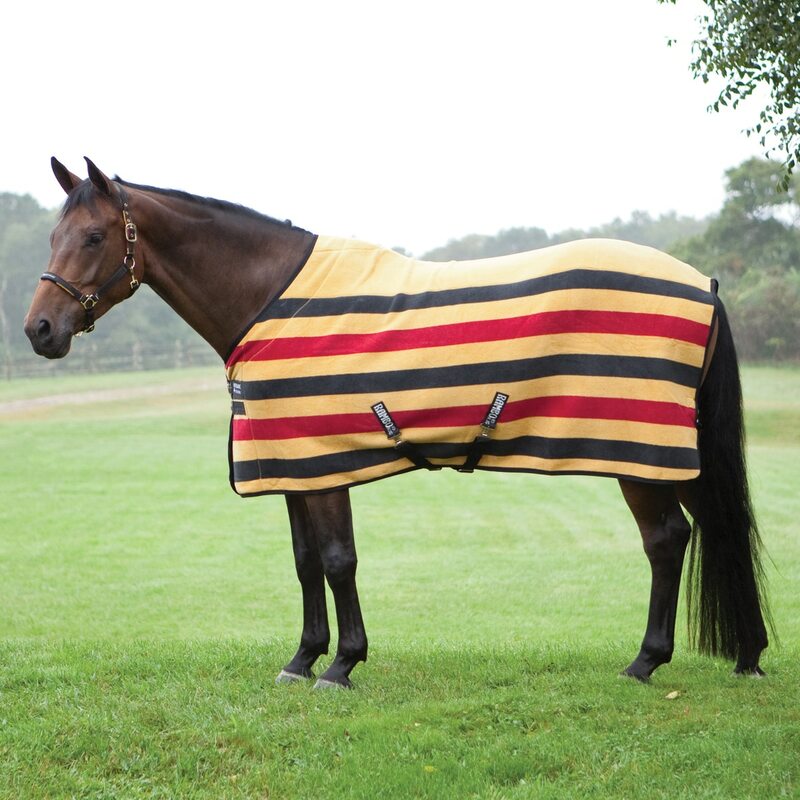 It even has double front closures, cross-belly surcingles, and a tail cord to keep it securely in place and can be used as a cozy layer as well as for cooling off after a ride, drying off after a bath, or trailering. Last but not least, it coordinates with the Rambo Newmarket accessories for a super stylish look. Rambo® Deluxe Fleece is rated 4.8 out of 5 by 31. Rated 4 out of 5 by WhyMe from Nice but RUNS VERY SMALL My horse wears a 78" Amigo BugBuster fly sheet, 81" Amigo Evolution fly sheet, 81" Rambo Original blanket (fits into a 78" but 81" is better). This 78" fleece sheet was way too small. Just crossed the top of his croup so a good 6-9" too short. Rated 3 out of 5 by color from Misleading photo I ordered this based on the picture rather than the description. It is really DARK navy. Rambo is at fault for this as the picture is the same on any vendor's site. Otherwise a good product. But I hate misleading photos/descriptions and felt I should comment. Rated 5 out of 5 by thoroughbredlove from Best fleece I've used I actually already own two other fleece products from Rambo, a quarter sheet and another deluxe fleece in brown. I loved the grey so I bought this one as well. Both have the nice plaid underside which looks so smart. The fleece is not stretchy and it is thicker than other fleece blankets. Very well made and long lasting. I highly recommend this and on sale, what a great bargain! Rated 5 out of 5 by Bdstelli from Classic colors and quality Bought this for my guy and couldn’t be happier. Fits well and excellent quality. Nice weight to it without being to heavy. Rated 5 out of 5 by Retiree from High Quality Fleece This is beautifully made with gorgeous fleece. It fits well and looks gorgeous on my black Friesian Sport Horse. I love that it is lined and has structure to it. A bit pricey but very much worth the cost. Rated 5 out of 5 by Sassymare from Beautifully made blanket This fleece is much thicker and higher quality than most coolers. Works great under other blankets. Love the color too. Highly recommend it. 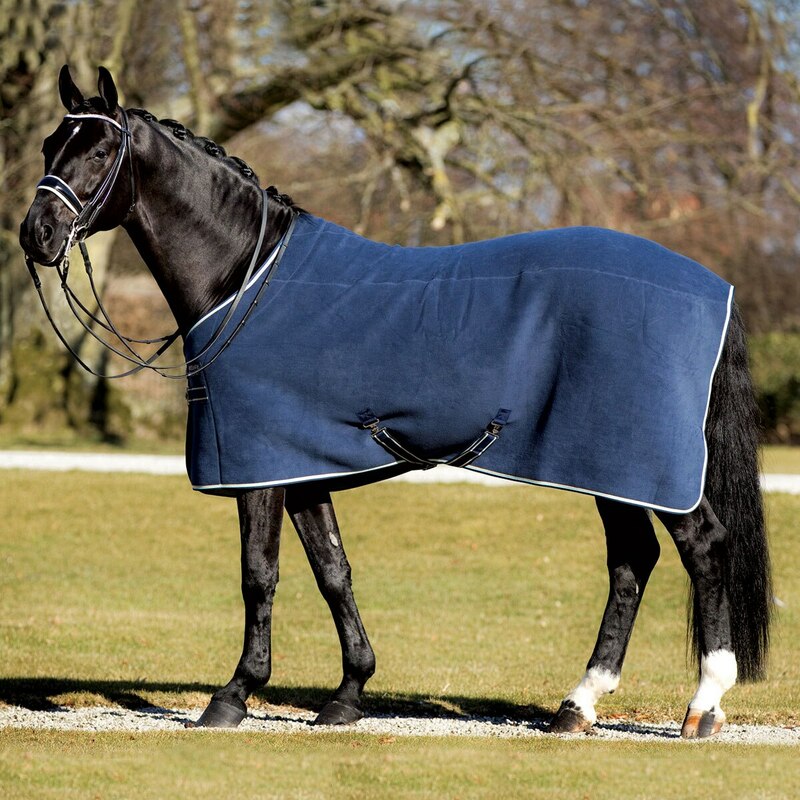 Rated 5 out of 5 by Springhope Farm from Wonderful This is a wonderful fleece cooler/stable blanket! My hot sweaty horses cool quickly with this cooler on and it effectively wicks the sweat away. When I take it off, the horse is dry and the outside of the cooler has beaded moisture. I hang it to dry in the barn and it dries very quickly (when the air is low humidity). I have one for each horse and use them routinely as a stable blanket too. Being fleece, the material picks up bedding after the horse lays down but I take a whisk broom and sweep it off before storing the blanket. This is one of my favorite items! Rated 5 out of 5 by Sarah from Love it! I absolutely love this fleece! 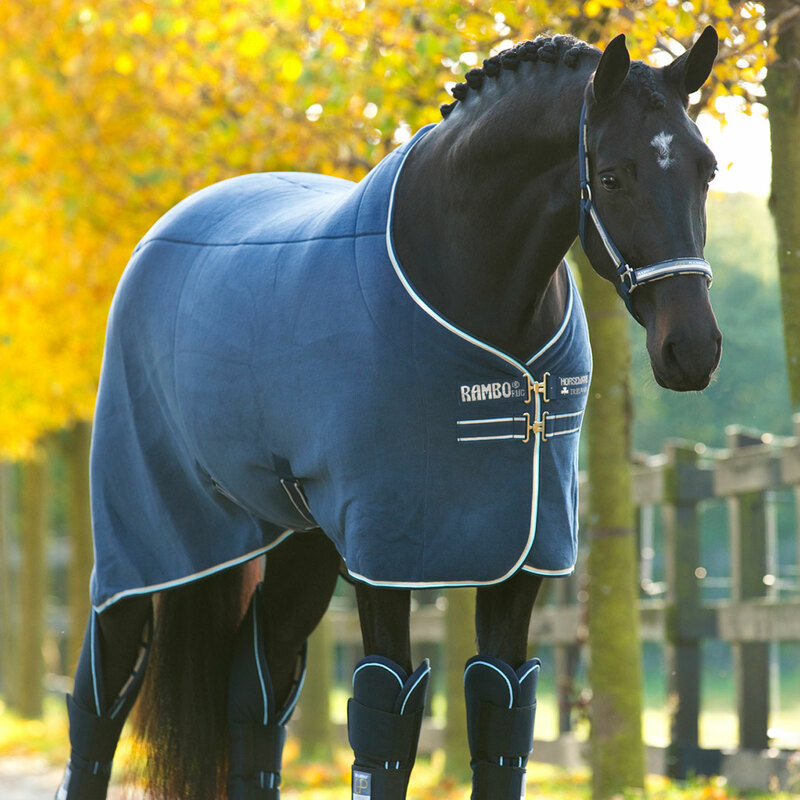 The excellent quality that comes standard with a Horseware Rambo product definitely extends to the deluxe fleece. 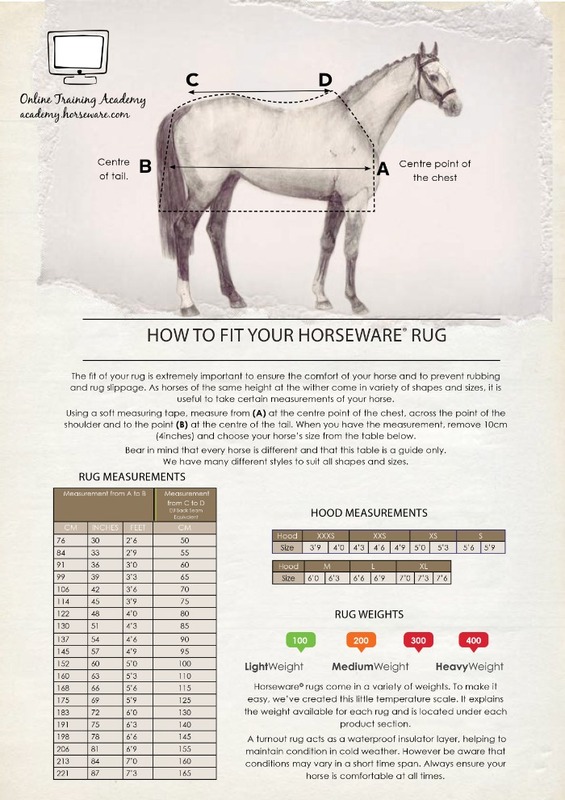 This is a must-have for every tack trunk and so versatile. Use it for a base layer, a cooler, travel or even for yourself to stay warm while waiting around the barn or showgrounds! Worth the money for the quality...it'll last forever. Rated 5 out of 5 by Hammer from Nice cooler! This is a great cooler! It is made from a heavier, thicker fleece than most coolers and is well stitched. The tail strap and belly straps make it safe enough to leave on unattended or as a lighter blanket under a rain sheet.